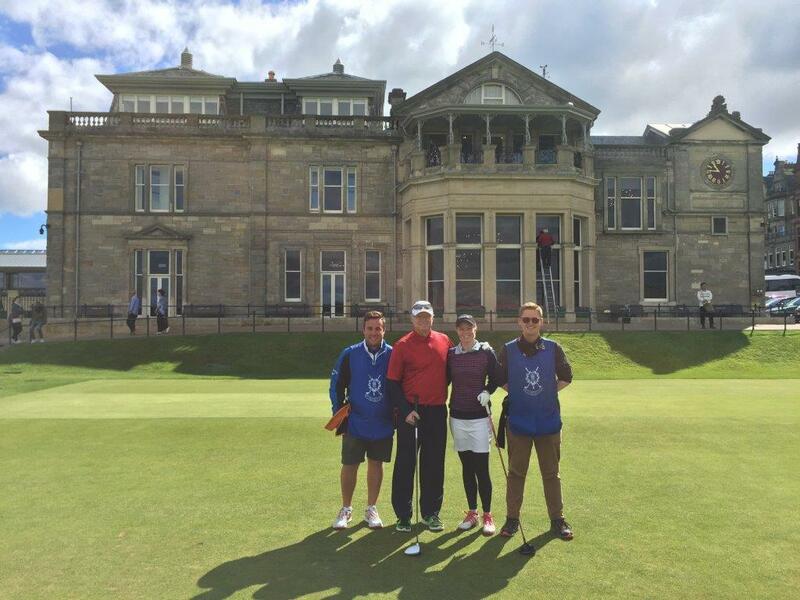 A visitor’s account of a once in a lifetime trip to the Home of Golf and playing the famous Old Course. Like so many other golfers around the world, we had been dreaming of visiting St. Andrews, the Home of Golf, for as long as we could remember. From a young age golf was a time where I got to spend a few hours alone with my dad. We went to the driving range, played at a local par 3 course, took lessons, hit balls in our backyard and got yelled at by mom when a stray ball would hit the house. It was our time to connect and it was special for both of us. So when we figured out how to make the pilgrimage to the Old Course, we knew it would be extra special. Our decision was relatively last-minute, only deciding a few months before our trip. 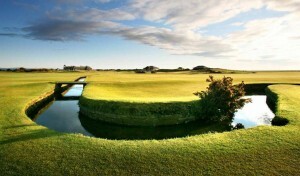 In contrast many people make their tee-times over a year in advance to guarantee themselves a tee-time on the Old Course. I had just moved to Munich in January as part of an international rotation with my work, for whom I also work in the United States, and we decided this would be our ideal year to make our dream happen. 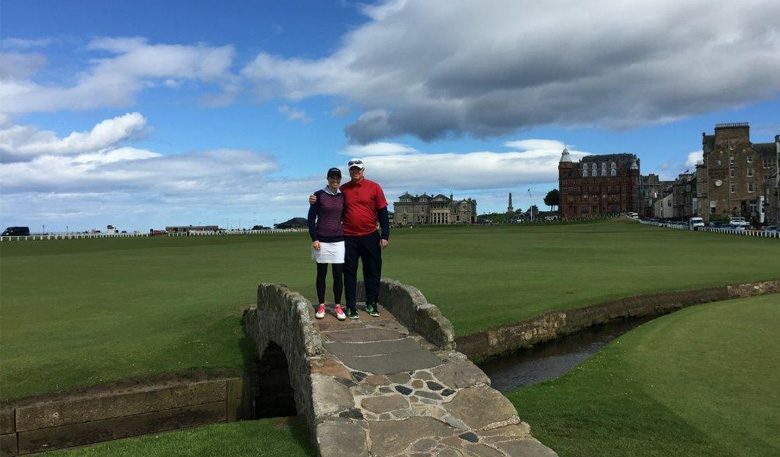 Once arriving in St. Andrews on Monday evening, the first thing we did was to check to see if we had gotten lucky in the ballot for a tee-time and couldn’t have been happier to learn that we had a Wednesday morning tee time! This got us so excited that we couldn’t wait until the next day to play a practice round, we headed straight out to the New Course to warm up. We had played about 10 holes before it threatened to get so dark we wouldn’t be able to find our way back to the clubhouse. It had been over 9 months since I had picked up a golf club. Between the freezing winter of Minnesota and my lack of car in Munich, I was really out of golf shape. 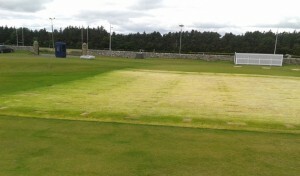 So on Tuesday I headed over to the St. Andrews Links Golf Academy to visit Steve North. He gave me a great lesson to get me ready to play links style courses in the wind and tackling the pot bunkers the Old Course is famous for. We worked on low shots into the wind using his high-tech equipment that used radar to track my ball fight. What a way to see exactly what your shots will do! It gave me the confidence going into our round on Wednesday. After a few tries out of the practice bunker I felt ready! 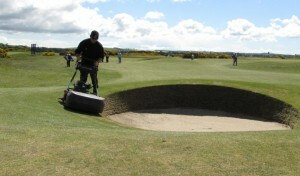 I knew that years of watching The Open would not prepare me for the experience of playing on this legendary golf course; I had seen the pros take several stokes to recover from a bad bounce or a slightly misplaced tee shot, but I was too busy looking at the amazing views and reminding myself of where I was to care that I was in my 6th bunker, right against the lip, listening to my caddie joking about my knack for finding the smallest bunker on each hole. My dad and I both had memorable shots, including getting stuck in the bunkers, the great shots out of them and getting our drives over the hotel on number 17. But of course or greatest memory is walking across the legendary bridge on 18.